Campaigners want Newport Council to break ties with a province in China over a 10-day dog meat festival. More than 10,000 dogs are killed and eaten every year at Yulin's Lychee and Dog Meat Festival in Guangxi, which twinned with Newport in 1996. By Friday, more than 17,000 people had signed a petition calling for all ties to be axed until the practice is stopped. The council said it would consider the petition if and when it was received. Eating dog in China dates back at least 400 years and is not illegal there, but the festival only began in 2009 - 13 years after the twinning was established. Campaigner Leah Austin said: "I think it is really sad that Newport is aligned with such sickening animal cruelty. "It only started in 2009 so it is not an ingrained tradition and many Chinese people themselves are totally repulsed by it. "Newport needs to stand up against this type of inexcusable and repugnant behaviour and let the world know that it should not and will not be tolerated." Kathryn Brown added: "There is no way Newport should be condoning this sort of barbaric practice." The petition, by Matthew James, recognises that the social agreement "is intended to foster friendship and understanding between different cultures". But adds: "There is no question that this cruel 'festival' has no place in the 21st Century. "Our great city of Newport should completely cut any ties relating to this event and do everything we can to end the abduction of stray and pet dogs." Officials from Newport last visited China in 1999 and a Chinese delegation visited the city in 2004 for the National Eisteddfod in the grounds of Tredegar House. RSPCA international spokesman Paul Littlefair said: "Our primary concern is the unnecessary suffering of the animals at the festival and their welfare during transport, handling and slaughter. "The theft of pet dogs is an ever-growing problem across the country as criminal gangs try to supply the demand for dogs in the run-up to the festival." 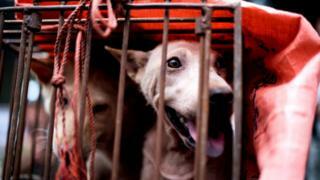 He said a coalition of animal charities had written to the central government and senior figures of Guangxi. A Newport council spokesperson said: "We will consider the petition in line with council policy if and when it receives it."